Fewer beer styles are more polarizing — and more fervently reviled/defended — than that of the pumpkin beer. Whether it’s an ale or an imperial stout, pumpkins have found their way into the vats of brewers everywhere, and the results are mixed. Anyone who has attended the Great American Beer Festival — Denver’s mightiest beer event — is familiar with the overwhelming experience that is the festival hall. 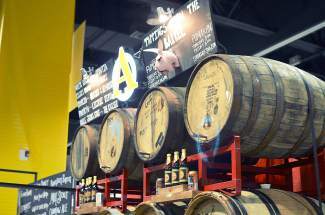 This year, the hall featured over 700 breweries with more than 3,500 different beers. It’s enough to intimidate even the most dauntless beer taster. Nevertheless, we intrepid enthusiasts dive in, taking notes and chatting up brewers, volunteers and fellow festivalgoers in our quest for the most delicious, bitter, experimental and out-there beers available. One of my missions, this time around, was pumpkin beers. Hunting down pumpkin beers was much like trying to catch a celebrity in an everyday situation. The information was sketchy at best, and I relied heavily on word-of-mouth, moving furtively from booth to booth, scanning the labels, looking for that telltale pumpkin. Winner of the pumpkin beer gold medal this year was the organic Wolaver’s Pumpkin Ale by the Otter Creek Brewing Co. of Vermont. It’s not surprising that an organic beer won in a style category with a fruit as a focal point. Next, with a silver medal, was Spiced Harvest by Old Dominion Brewing Co. of Delaware, while the Whole Hog Pumpkin Ale by Stevens Point Brewery from Wisconsin took bronze. Following are a few other examples of pumpkin beers to be found at the festival, and my personal impressions of them. This beer from No Label Brewing Co. in Texas gets into the fall spirit right off the bat, with its name reminiscent of a popular horror movie. Fortunately, the beer itself is anything but horror-filled. It was one of the sweeter pumpkin beers I tasted, despite being an imperial pumpkin ale rather than a regular ale. Its IBU (bitterness rating) comes in at a low 15, whereas its ABV (alcohol by volume) is a high 9.3 percent. The beer claims an imperial amber ale as its base and is spiced up with ginger and cloves, plus a hint of cinnamon. A nice option for anyone with a sweet tooth who doesn’t mind that it comes with a significant alcohol level. Bonus points awarded for name creativity. Yet another imperial pumpkin beer, this time from Weyerbacher Brewing Co. in Pennsylvania. I stumbled upon this one thanks to a tip from a volunteer pouring a decidedly lesser pumpkin beer. I definitely preferred the spice profile in this one to Nightmare on 1st Street. It leaned more toward the sharper spice feel than the sweet spice feel. It had the same hints of cinnamon, cloves and allspice, with a touch of cardamom to make it interesting. This imperial packs slightly less of a punch at 8 percent ABV, and took home a bronze medal in the Field Beer category at GABF in 2010. This ale comes from the long line of Saranac beers from the Matt Brewing Co. in New York. It’s the perfect example of an average pumpkin beer — not too sweet, not too spicy, not too interesting. It’s got the usual cache of cinnamon-type spices and clocks in at an easy 5.1 percent ABV. “I’m not a huge pumpkin beer guy, and I like this one,” said Rob Gibbons, the volunteer pouring samples of the pumpkin ale. Gibbons has been a volunteer at the festival for six years, and loved every minute of it. Lexington Brewing and Distilling Co. has been expanding its beer selection, and the Pumpkin Barrel Ale is one of the results. The company uses its own bourbon barrels to beef up its ales, and each of them has that distinct woody bourbon taste. This pumpkin ale comes in at a healthy 10 percent ABV and the bourbon barrel aging adds a punch to the pumpkin flavor, with just a bare hint of cinnamon and nutmeg. It’s the perfect beer for the serious drinker who wants just a dash of autumn whimsy. This beer is part of the Farm to Barrel Series by Almanac Beer Co. in San Francisco. It’s actually a barleywine with organic heirloom pumpkins mixed in. It’s also aged in rye and brandy barrels. Of the pumpkin beers I tasted, this one offered the most exquisite balance between fruitiness of the pumpkin flavor and sharp spiciness. The smell alone is enough to transport you to the middle of a frosty autumn field, but one sip will warm you right down the middle. It’s the heftiest of the pumpkin beers at 12 percent ABV, so it definitely requires sipping rather than gulping, but it’s so perfectly balanced in flavor that you don’t mind. Without a doubt, the Heirloom Pumpkin comes in at my No. 1.